Why save your tastiest dishes for the holidays only to burn yourself taking them out of the oven? The most wonderful time of the year can also be one of the most dangerous. We climb ladders to decorate. We let irritable loved ones boost our stress levels. And we invite happy chaos into kitchens with hot surfaces and sharp knives. All these ingredients add up to a recipe for an emergency room visit. And that’s before you add alcohol to the mix. In fact, people tend to find the perfect recipe for disaster during the holidays. According to the Blue Cross and Blue Shield Association, emergency rooms see nearly 45% more visits during the winter holidays than summer months. Want to Avoid the ER? Try these recipes. Each one is a step-by-step guide to a safer celebration – where the only surprises will be the ones you wrap in bows. Start with one regular home. Add yards of lights, boxes of decorations and several extra amps of AC power. Season with open candle flames, roaring fireplaces and flammable greenery. Don’t leave candles or the fireplace unattended. When you’re climbing a ladder, always follow instructions and rely on a spotter. Don’t carry anything too heavy. Grab a family member! For every dish destined for the table, place one extra cook in the kitchen – plus multiple hot burners, open oven doors and razor-sharp knives. Sprinkle liberally with time pressure. Schedule cooking times for different dishes to have only one or two literal cooks in the kitchen at a time. Use caution with carving tools and knives – and keep them away from children. Be mindful of cleanliness and bacteria when handling cutting boards and dishes that have contained uncooked food. Be careful when you’re taking things out of the oven. Keep oven mitts and potholders where guests can easily see and use them. Be sure to remind kids that stoves can be hot. Never leave children alone in the kitchen and make sure pot handles are out of reach. To a mixture of personal allergies and preferences, gently fold in dishes from other people’s kitchens, uncertain heating times due to shared oven space and a lack of refrigerator space for safe food storage. Avoid serving leftovers that are too old or were left out for too long at room temperature. Make sure to cook all food thoroughly to meet the recommended temperature for each item. Ask your guests about food allergies and restrictions so your holiday table doesn’t hold hidden dangers. Does the spirit move you? Popping corks and clinking glasses can be a recipe for cheer – as long as people know their limits and respect the house rules. Have fun, but avoid excessive alcohol consumption. Respect the decisions of people who prefer not to drink. Store alcoholic beverages out of reach of those who are not old enough to drink. And never ever drink and drive. There’s one ingredient in family harmony that can run short around the holidays: elbow room. Remember why you’ve gathered – and leave hot-button issues and personal grudges at the door. Do at least as much listening as talking! Give yourself some alone time. If you’re hosting, make sure guests have quiet places where they can retreat for a breather. If the temperature in the room (or between your ears) starts rising, recognize the signs. Find an activity that calms you down – or change the subject. The holidays take us out of almost every routine: work, diet, even exercise. But your body doesn’t take a vacation from needing care. Set calendar or phone reminders to help you maintain any prescribed treatment regimens. If you’re traveling, make sure to pack any medications you take regularly or may need in an emergency. Remember that heart attacks, depression and other conditions often peak this time of year. Watch for signs you may need help. If you feel something is wrong, get checked out! What to do if you get hurt. Know where the nearest emergency room is located – but don’t treat the Emergency Room as the first option for care. Urgent care centers and retail clinics can often provide the care you need with less wait and expense. Make sure to locate ones near your holiday location in case an accident or injury occurs. 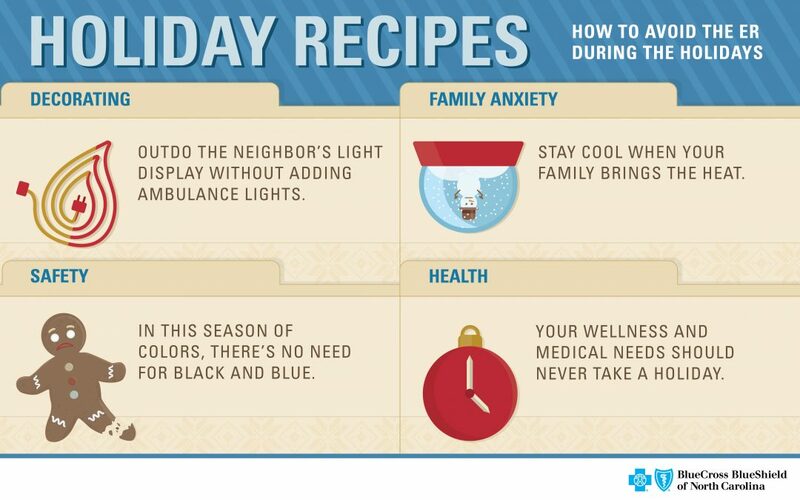 BCBSNC’s 24/7 nurse hotline, Health Line Blue (1-877-477-2424), can be an especially valuable resource on holidays when other care locations may be closed. The hotline is here to answer questions if you want to discuss your options for care. Before you seek medical care, visit our Know Where to Go page to determine whether you need to go to an urgent care or the ER, and to find the location closest to you. Our Find a Doctor tool is also useful when locating in-network providers. If your family decides to take an international trip and an emergency occurs, go to an ER. However, in all other cases, coordinate your care through BlueCard Worldwide. Happy Holidays! We at Blue Cross and Blue Shield of North Carolina hope the season brings you lots of joy and no injuries!